Brown bear photo with Silver Salmon in Katmai National park. This bear was one of a few we saw in Kinak Bay, just north of Geographic Harbor. The Silver Salmon were running thick in this little creek, and the fishing was at time fast and furious. Great to see. We saw wolf, whale and bald eagles as well, all before our first day had ended. We had some great photo opportunities with some Harbor Seals, and spent an hour or more trying to catch some wary sea otters; in the end, we got a few nice images. But the bears, as they almost always do, stole the show. 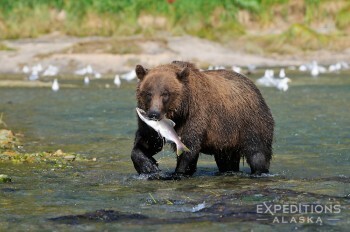 Heading back to Katmai in a few days for more of the same, on the other side of the park. And I can’t wait!